SAN FRANCISCO, Oct. 30, 2018 /PRNewswire/ -- Genesys® (www.genesys.com), the global leader in omnichannel customer experience and contact center solutions, introduced today the industry's first forecasting and scheduling service for workforce management powered by artificial intelligence (AI). Now businesses can use AI to predict the best possible staffing schedules with unprecedented speed and accuracy, saving time and money in the process. This capability is available through Genesys Automated Forecasting and Scheduling, the hallmark of the company's Winter Innovations aimed at empowering employees with solutions to work smarter through AI and automation. According to Genesys Chief Product Officer Peter Graf, "We're enabling businesses of all sizes to realize their entire AI strategy on one platform. With voicebots and chatbots, workforce management, predictive analytics and more, our Winter Innovations introduce a series of applications that deliver on the promise of AI at scale. What's even more exciting is our AI innovations work in concert, sharing data insights that enrich the customer and employee experience and produce exponentially better business results." Recent research from Call Centre Helper indicates that today over 50% of businesses use tedious, manual methods for forecasting staffing levels and developing schedules for customer-facing departments like service, sales and marketing. Genesys Automated Forecasting compares parameters from more than 25 methodologies, evaluates hundreds of thousands of potential forecasts, and predicts the right one for businesses in under 30 seconds – with just one click. This capability is light-years ahead of other competitive offerings, which typically only compare up to three methodologies and can take hours – even days – to generate results. Genesys Automated Forecasting is the most precise solution on the market today with proven accuracy of 95-97 percent, which is well above industry standards. 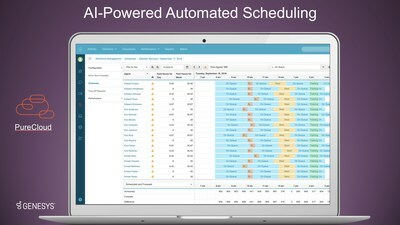 The companion to Genesys Forecasting, Automated Scheduling also relies on AI models to produce staffing schedules up to 60 times faster than traditional methods. Businesses can now create an optimized schedule in just a few minutes – hours less than it takes other vendors' decades-old, rule-based algorithms. Genesys Automated Scheduling revolutionizes the process, enabling contact center planners to compare multiple schedules simultaneously and make updates on the fly to quickly accommodate unexpected staffing changes. "Genesys Automated Forecasting and Scheduling is a game changer," said Ken Landoline, principal analyst of Customer Engagement at research firm Ovum. "At best, the old process is labor-and-time intensive and, at worst, riddled with human error. The new Genesys automated forecasting and scheduling solution completely overhauls this archaic human-intensive process, freeing up employee time for higher yield activities. For business, it has the potential to pay off in dividends – driving efficiency while also mitigating the costs associated with idle agents, overwhelmed employees and frustrated customers." Genesys Automated Forecasting and Scheduling counts among the hundreds of other Winter Innovations to be released over the next few months as cloud services across the company's product portfolio, which includes PureCloud®, PureConnect™ and PureEngage™. This cloud-based delivery empowers customers to adopt new features and services quickly and easily. Automated agents – Automate conversations with customers, using new native Genesys or third-party voicebots and chatbots, including Google Contact Center AI and Amazon Lex, whether they're happening via a phone, smart speaker, laptop, tablet or app. Automated agent assistance – Designed to improve the employee experience, AI-powered virtual assistants can now listen and automatically surface the right information or suggest a next-best action to help agents solve customer issues in real-time. Predictive engagement and prospect conversion – Leveraging machine learning, now businesses can better manage and shape prospect journeys using predictive outcome scoring to improve ROI and convert more sales by reaching out to prospects at the right point in their journey via chat, callback or content offers. Performance DNA with Predictive Routing – By integrating Performance DNA with machine learning-based Predictive Routing, employee and customer matching capability is significantly enhanced. It now expands target profiles beyond factors, like handle times, to take into account more complex parameters such as employee knowledge, feedback, individual desires and performance history. Additionally, new integrations with top messaging applications enable businesses to easily adopt this growing channel, while increasing efficiency through automation using Genesys voicebots and chatbots. PureCloud customers can now engage consumers on LINE, Twitter, and Facebook. In addition, WhatsApp is now available with PureEngage, joining Apple Business Chat, WeChat, LINE, Facebook and Twitter. Register for the Genesys Winter Innovations webinar on November 14, 2018 for an overview of the new Genesys Automated Forecasting and Scheduling and to hear more about what's new and what's next from Genesys. ©2018 Genesys Telecommunications Laboratories, Inc. All rights reserved. Genesys, the Genesys logo, Genesys PureCloud, PureConnect, PureEngage, Blended AI and Kate are trademarks and/or registered trademarks of Genesys. All other company names and logos may be registered trademarks or trademarks of their respective companies.